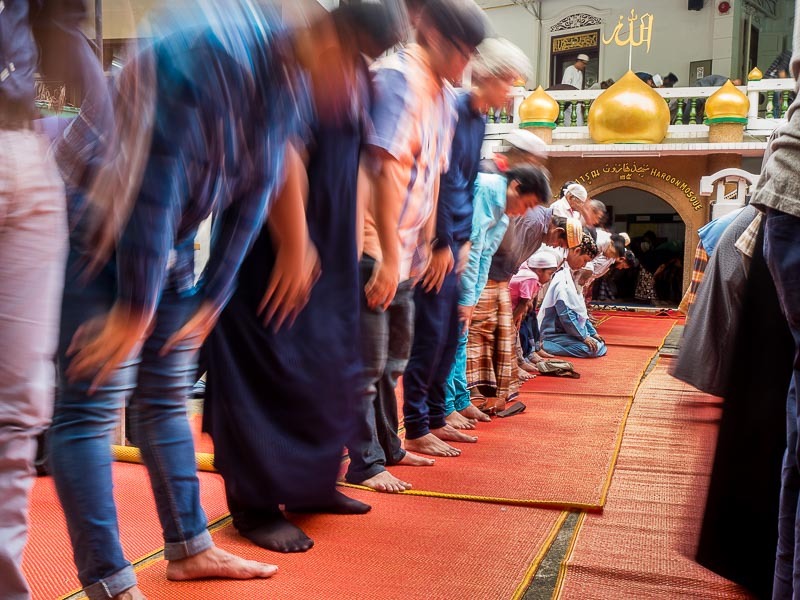 Men pray at Haroon Mosque in Bangkok during Eid al-Adha services. Eid al-Adha is also called the Feast of Sacrifice, the Greater Eid or Baqar-Eid. Eid al-Adha marks the Old Testament story about the willingness of Abraham to sacrifice his son to God. Abraham (Ibrahim in the Muslim world) is an important figure in three world religions, Islam, Christianity and Jewish. 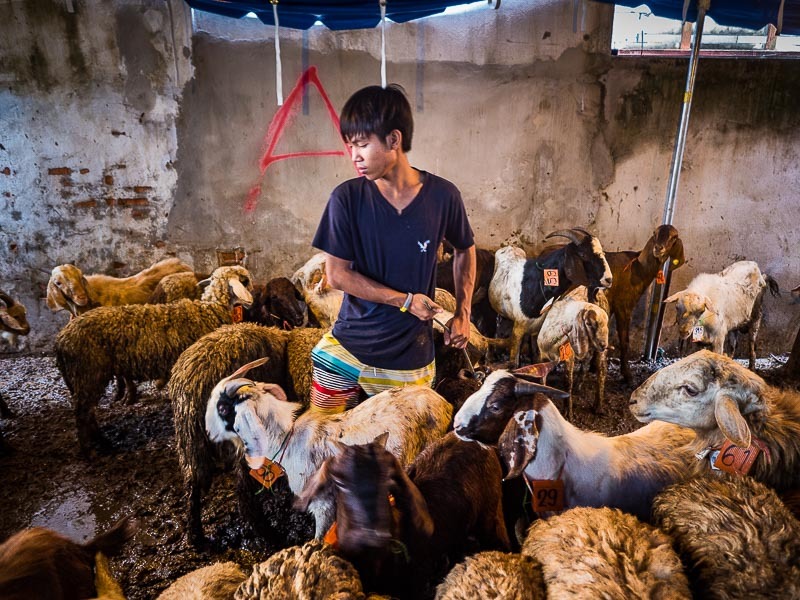 The Muslim holiday of Eid al-Adha is marked with the ritual sacrifice of animals, usually goats, sheep or cattle. The meat from the sacrificed animal is divided into three parts. The family retains one third of the share; another third is given to relatives, friends and neighbors; and the remaining third is given to the poor and needy. Girls wait for Eid services to start at Haroon Mosque. 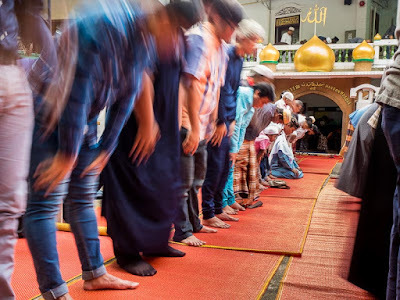 I went to Haroon Mosque, one of the most historic mosques in Bangkok, to photograph Eid. Haroon Mosque was established by Javanese (now Indonesia) traders in the 1820s. 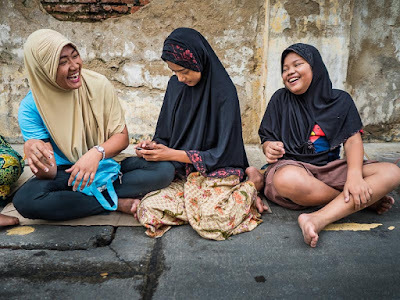 It's the center of a Thai Muslim community but it also serves Muslim immigrants and tourists to Thailand. Eid al-Adha services at Haroon Mosque. 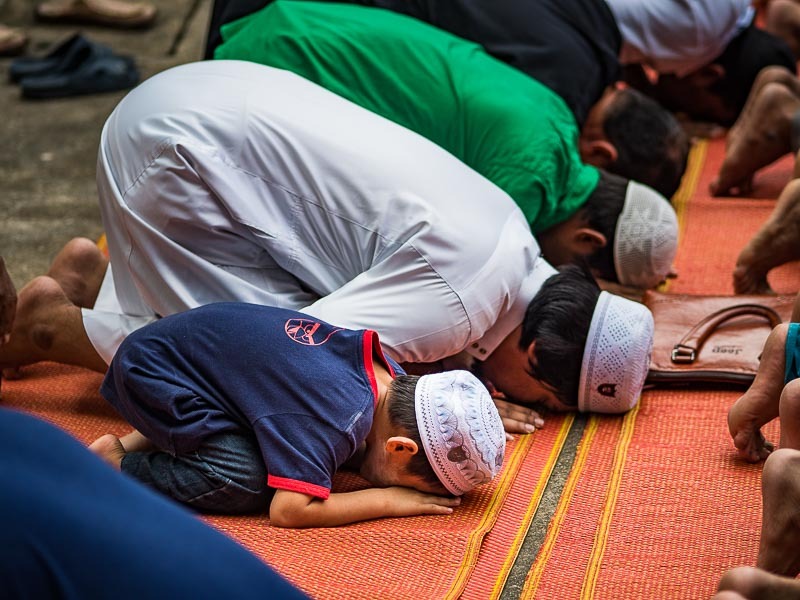 So many people come to the mosque for Eid that they put mats out on the sidewalks around the mosque and most of the men pray outside. After the service people gathered around small pens behind the mosque for the ritual slaughter. A goat is led out of the pen to its slaughter. People buy a goat or sheep. Some people sacrifice it themselves, others have one of the workers do it. A prayer is said over the animal and its throat is slit. Then the animal bleeds out. 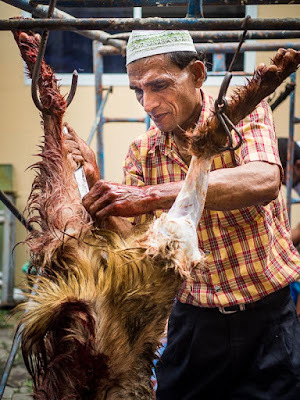 Men from the mosque start butchering the animal as soon as it dies. The whole process, from start to finish, takes about 45 minutes. 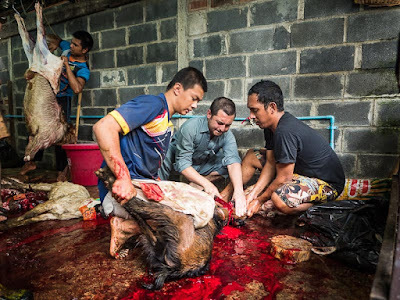 Men sacrifice a goat while another man butchers one. Covering Eid was a part of my ongoing project on spirituality and religious diversity in Thailand. Photographing events like the ritual sacrifices at Eid is difficult. I was invited into the service and no one put any restrictions on what I could and could not photograph. There were physical limits - the sacrifices were being done in the midst of a large crowd jammed into a small space, so squeezing into a place where I could photograph was difficult. People tried to accommodate and make room for me but it was a tight fit. Then there's the nature of what I was photographing. It was a sacred moment, and a prayer was offered before each and every animal was sacrificed. But it was gruesome. People in the US and Europe are divorced from where their food comes from. They go to the local supermarket and pick up a piece of beef or a chicken or fish or whatever. It's packed in styrofoam and plastic wrap and no messier than buying a new shirt or an iPhone. They generally don't know (or care) how the animal they are about to eat lived and died. I've photographed Eid al-Adha a couple of times. I've also photographed in butcher shops and slaughter houses. Those places are far more brutal than the sacrifices at Eid. It was important to me that I not abuse the invitation and kindness people showed me during Eid. After the goats were exsanguinated, men butcher them. Muslims are the largest religious minority in Thailand. Even though Christian holidays, especially Christmas, are widely celebrated throughout Thailand, holy days like Eid and month of Ramadan are far more important. 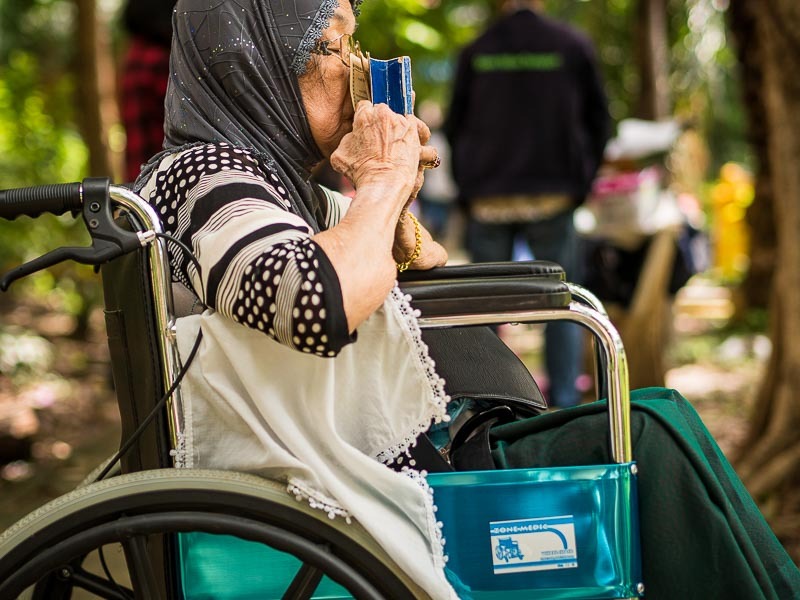 A woman in a wheelchair kisses her Q'uran after Eid services at Haroon Mosque. There are more photos from Eid al-Adha in my archive or available from ZUMA Press.